Which Comes First Baptism or Eucharist? The following is a copy of a paper submitted for my Book of Common Prayer Class at Yale Divinity School during the Fall Semester 2015. The paper was submitted to Dean Andrew McGowan on 23 October 2015. The Episcopal Church is no stranger to controversy. Of the plethora of current theological, liturgical, social, and ethical debates there is one that seems to attract a significant amount of attention: should we offer communion to people before they are baptized? Commonly referred to as “open table” or “communion regardless of Baptism,” this heated and passionate debate has put The Episcopal Church in a sacramental/theological chicken-or-egg discussion: which comes first. 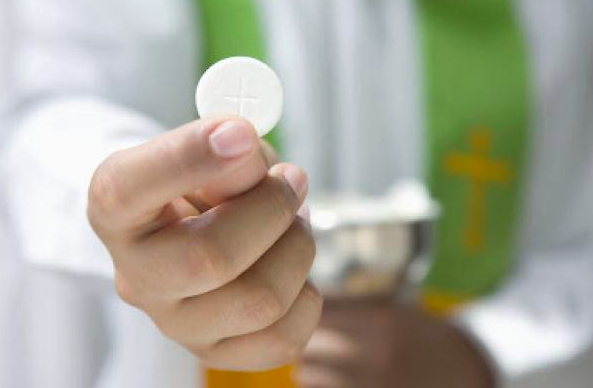 Baptism or Eucharist? Scholars, clergy, and lay people on both sides of this debate often argue from the point of view of Scripture, theology, hospitality, and evangelism, but it seems that few are looking at this question, of the relationship between Baptism and Eucharist, from the perspective of the theology of The Episcopal Church as expressed in the Book of Common Prayer. In order to have a fuller understanding of this conversation, it is important to look not only at the current rites of Baptism and Eucharist, but the 1979 Book of Common Prayer as a whole. With this frame, it is possible to come to a liturgically and theologically sound answer to the question: should we offer communion to people before they are baptized? To consider this debate regarding initiation and order of the sacraments, it is crucial to look first at the characteristics that frame the character and nature of the Book of Common Prayer. With the general nature of the 1979 Book in place, shifting to the specific liturgical rites of Holy Baptism and Holy Eucharist allows for the theological understandings – as understood by The Episcopal Church – to emerge. These contextual frames provided a clearer interpretation and answer for the question: should we offer communion to people before they are baptized? In many ways, the 1979 Book of Common Prayer continues to uphold the venerable tradition of the various Books of Common Prayer that date back to the first books – the Books of Edward VI (1549, 1552). The preface of these two books outlines three fundamental criteria on which all subsequent Books of Common Prayer are judged, “So here you have an order for prayer (as touching the reading of the holy Scripture), much agreeable to the mind and purpose of the old fathers, and a great deal more profitable and commodious, that that which of late was used.” In other words, for a prayer book to live up to the standard set forth by Thomas Cranmer and his contemporaries it must be rooted in Holy Scripture, follow the practices of the early church, and enrich those who use it. These “have hovered like seraphim over the deliberators who have produced every succeeding revision of the Prayer Book.” The most recent American prayer book also embraces these angelic criterions. In regards to Scriptural authority, the 1979 Book of Common Prayer has a renewed emphasis on the biblical text. It has significantly expanded the amount of Scripture that worshippers are exposed to by expanding the one-year Eucharistic lectionary and one-year Daily Office lectionary of the 1928 Book of Common Prayer  to a three-year Eucharistic lectionary and a two-year Daily Office lectionary. This lectionary expansion also includes the reintroduction of the lesson from the Hebrew Bible and the Psalms. In addition to the amount of Scripture worshippers were exposed to, the Biblical theology expressed in worship has also been expanded: almost all of the Eucharistic prayers, with the exception of the Canon taken from the 1928 Book, proclaim the Biblical narrative of Christ’s life, death, and resurrection; there are increased biblical references in the Thanksgiving over the Water and other parts of the Baptismal liturgy; there are more scriptural options for Easter than any other American or English prayer book; and there is also a renewed emphasis on the Holy Spirit, the Church, and the nature of Sunday that fills the entire 1979 Book. The emphasis on grounding the prayer book in Scripture does not end with the inclusion of more scripture passages and references in the various liturgies of the church. There is now an expectation – or at the very least a provision – that a sermon is preached at every service. In comparison to the 1979 revision, all other American Books of Common Prayer seemingly failed being grounded in Scripture to the extent put forth by Cranmer. One of the great gifts of the twentieth century ecumenical and liturgical movements is the focus on recovering the ancient liturgical practices of the Church. In the years between the 1928 Book and the 1979 Book, understandings of worship in the Early Church changed drastically. One monumental recovery of this movement is the proper liturgies for Holy Week. No other English or American prayer book has liturgies appointed for this holiest of weeks most likely because the practices of the early church “fell on hard times, dropping almost completely from the early English rites.” With the recovery of, what is now known as Egeria’s Travels, other similar works, and the liturgical movement of the Roman Catholic Church, these elegant and elaborate liturgical practices of at least the fourth century were recovered and included in the 1979 Book. The occasions on which the Proposed Book teaches those who use it are numerous. Here are some of them: the Proper Liturgies for Special Days, the provision for a homily or sermon at every service, the Baptismal Service which involves the worshipping congregation, the learning which accompanies lay participation in the conduct of services, the amount of Holy Scripture which is heard by congregations in the enlightening context of the season or service, such as Marriage or Burial, and the more broadly based Catechism. These are among the ways in which edifying the people takes on new significance. As with both other areas of critique, it seems that the current American Book of Common Prayer out shines its predecessors in fulfilling the Cranmerian requirements on which Books of Common Prayer rest. With this understanding of the general character and principles of the 1979 Book of Common Prayer in mind, an answer to the question – should we offer communion to people before they are baptized – begins to emerge. This answer extends from the overall character of the 1979 Book in terms of Scripture, Early Church practice, and the edification of the people. Having framed the general liturgical and theological character of the 1979 Book, it is possible to look at the specific liturgies for Holy Baptism and Holy Eucharist. The Baptismal rite itself is significantly different in the 1979 Book compared to the rite in the 1928 Book, including its physical placement in the Book itself. Before the Baptismal liturgy begins, a theological statement is made as a result of the placement of the liturgy in the Book. The section on Holy Baptism comes immediately before the section on The Holy Eucharist – putting these two liturgical offerings together in the Book highlights the connectedness of these two foundational sacraments. The setting of Baptism also marks one of the shifts in the 1979 version of the rite compared to the 1928 version. In the 1928 Book, Baptism happened in the context of Morning Prayer. But, in the 1979 version Baptism occurs within the context of the Holy Eucharist. This restores the “ancient three-fold initiatory unity [of] – Baptism, the Sealing with the Spirit, and First Communion.” This is in line with the focus on the practices of the ancient Church that guides the overall character of the 1979 Book. The Baptismal shift in the 1979 Book also highlight the renewal of the ministry of the various orders of the Church as previously stated. Beyond the liturgical aspects of Baptism, the 1979 Book in general has a far greater emphasis on Baptism than previous Books of Common Prayer, which represent the recovery of the “significance of baptism in the lives of all Christians.” This significant theological development highlights the differences between a life in Christ and life in this world, and is expressed both in the importance of the Easter Vigil and the various dates for Baptism with the renewal of Baptismal vows. The connection between Baptism and the Easter Vigil is strengthened by the fact that the proper liturgy for the Easter Vigil precedes the section on Holy Baptism. Every time a person is baptized, the whole of the community has the opportunity to renew – to recommit – to the life and work of being the Body of Christ. By focusing on our baptismal ecclesiology, there is a renewed focus on what is means to be a participant in the Body of Christ, the Church. This focus on Baptism is also expressed in the ministry of the priesthood of all believers – the ministry of the laity. This ministry is “to represent Christ and his Church; to bear witness to him wherever they may be; and, according to the gifts given them, to carry on Christ’s work of reconciliation in the world; and to take their place in the life, worship, and governance of the Church.” In order to have the renewed focus on the participation of the laity, this ministry must be defined in light of Baptism. Baptism alone does not equip the laity for this important and powerful ministry it must be paired with the celebration of the Holy Eucharist. “Baptism and eucharist in particular function together to encode the “both-and” of the Christian experience of salvation: the radical gift of grace and the radical call to discipleship, inextricably connected.” It is the participation in the celebration of the Eucharist that transforms us each and every time we receive the bread and wine. In line with this soteriology, the catechism outlines the benefits that are received through participation in the Eucharist: “The benefits we receive are the forgiveness of our sins, the strengthening of our union with Christ and one another, an the foretaste of the heavenly banquet which is our nourishment in eternal life.” This important connection is reinforced and exists because of one of the major shifts in the 1979 Book compared with other Books of Common Prayer – the recovery of the Eucharist as the normative liturgy of the Church. Reclaiming the proper place of the Eucharist in the life of the Church puts the theology set forth in the Eucharistic liturgy at the heart of the expressed theology of The Episcopal Church. In your infinite love you made us for yourself; and, when we had fallen into sin and become subject to evil and death, you, in your mercy, sent Jesus Christ, your only and eternal Son, to share our human nature, to live and die as one of us, to reconcile us to you, the God and Father of All. He stretched out his arms upon the cross, and offered himself, in obedience to your will, a perfect sacrifice for the whole world. The Eucharistic rite of the 1979 prayer book also differs from its predecessor in that it is far more ecumenical. Other churches of the Anglican Communion, as well as, Lutheran and Roman Catholic communities of faith have, also adopted the order expressed in the current Book of Common Prayer. This reality embodies the ecumenical nature of the revision process that resulted in the 1979 Book. No long is liturgical revision in The Episcopal Church done in isolation, but instead done holding in mind what other Christian communities are practicing. Other changes exhibited in the 1979 Book have to do with clarification of rubrics and increased flexibility for local expression and variations in the liturgical year. By framing these two sacraments, and their respective liturgical expressions, in the context of the three criteria on which prayer book revision rests, it is clear that they both include exposure to a wide breath of Scriptural texts, the practices of the Early Church (normative practice of Baptism before Eucharist and the centrality of the Eucharist in the life of the Church), and that the edification of the people (the catechetical process in Baptism and by rehearsing the salvation narrative in the Eucharist). If the canonical restrictions of Baptism as a prerequisite for the Eucharist were to be removed, what would that do to the both-and soteriology of Baptism and Eucharist? How can a person be written into the primal Christological narrative if they are not part of the Body of Christ? The theologies of Baptism and Eucharist embodied in the liturgies of the 1979 Book become confused and inconsistent if we answer the question – should we offer communion to people before they are baptized – with a yes. It is clear that in Baptism we are grafted into the living Body of Christ, the mystical Body known as the Church. Likewise, the Eucharist is not just a meal to make those who partake feel good it is a radical offering and foretaste of the kingdom of God that comes with great risk and great reward. It is this reality that believers are grafted into at Baptism. In light of the specific liturgical rites of Holy Baptism and Holy Eucharist and their respective theological underpinnings, as well as the three categorical lenses from which the general character of the 1979 Book of Common Prayer is viewed, the answer becomes clear; and the answer to this question begins with the scriptural lens in which worship in The Episcopal Church is grounded. There are many who argue the practice of open communion from the perspective of the scriptural warrant. Citing stories where Jesus eats with tax collectors and sinners so we too should eat with the “outcasts” the “other” the non-Baptized. As the altar at St. Gregory of Nyssa Episcopal Church in San Francisco is inscribed, “Did not the Lord share the table of tax collectors and harlots? So then – do not distinguish between the worthy and unworthy. All must be equal in your eyes to love and to serve.” But what do the stories with explicit Eucharistic connection say? Not only does the eucharistic meal not limit the wider meal ministry of the church –fellowship meals, public meals, banquets for the homeless and poor – but the eucharist provides the foundation for those wider meals and the reason for their practice among those who have adopted Jesus’ kingdom vision. So, if the last supper with Jesus encoded with the disciples the whole thrust of his mission, setting his own impending sacrifice in the context of a life poured out for the kingdom to which they eventually understood themselves to be committed, then it is reasonable for us today to think about who participates in that meal and whether they have committed themselves to the vision that animated Jesus. The eucharistic meal is the place where the disciples continue to gather in intimate communion with Jesus Christ and from which they are empowered to move out into wider ministries of evangelism and service, including a ministry of eating and drinking in contexts beyond the bounds of this ritual practice. So what you see, then, is bread and a cup; that’s what even your eyes tell you; but as for what your faith asks to be instructed about, the bread is the body of Christ, the cup the blood of Christ . . . So if you want to understand the body of Christ, listen to the apostle telling the faithful, You, though, are the body of Christ and its members (1 Cor 12:27). So if it’s you that are the body of Christ and its members, it’s the mystery meaning you that has been placed on the Lord’s table; what you receive is the mystery that means you. It is to what you are that you reply Amen, and by so replying you express your assent. What you hear, you see, is The body of Christ, and you answer, Amen. So be a member of the body of Christ, in order to make that Amen true . . . Be what you can see, and receive what you are. In all of these cases, it is clear that in order to participate in the transformative meal of Christ’s body and blood one must be a member of that body by virtue of the sacrament of Baptism. These Scriptural, Early Church, and edification arguments are not exhaustive but provide a sample of the ways that the same critical theological reflection that goes into the liturgical theology of The Episcopal Church is employed in the contemporary debate regarding practices of open communion. Taking the specific liturgies together with the three critical groundings areas it is clear that the practice of offering communion to people before they are baptized is not consistent with the theological, liturgical, and soteriological understandings of The Episcopal Church. This raises the question: why are some in The Episcopal Church demanding that this normative practice of Baptism before Eucharist be changed? That is ultimately not a question that can be answered in this paper. However, what can be said is that, while a relatively recent edition of the Book of Common Prayer, the 1979 Book is a liturgical and theological expression of Anglican thought and practice that is scriptural, anciently rooted, and provides for the transformation of those who allow themselves to be immersed in its rich, dynamic, and beautiful offerings. The Book of Common Prayer and Administration of the Sacraments and Other Rites and Ceremonies of the Church According to the Use of The Episcopal Church (New York: Oxford University Press, 1979), 866. William Sydnor, The REAL Prayer Book: 1549 to the Present (Wilton, CT: Morehouse-Barlow, 1978), 107. Massey Hamilton Shepherd, Jr., The Oxford American Prayer Book Commentary (New York: Oxford University Press, 1973), x-xlv, 90-269. The Book of Common Prayer, 1979, 889-1001. Sydnor, The REAL Prayer Book, 108. James W. Farwell, This Is the Night: Suffering, Salvation, and The Liturgies of Holy Week (New York: T & T Clark, 2005), 43. Thaddaeus A. Schnitker, The Church’s Worship: The 1979 American Book of Common Prayer in a Historical Perspective (Frankfurt Am Main: Peter Lang, 1989), 122. Syndor, The REAL Prayer Book, 108. The Book of Common Prayer, 1979, 13. Syndor, The REAL Prayer Book, 109. The Book of Common Prayer, 1979, 298. Holy Baptism with the Laying-On-Of-Hands, vol. 18, Prayer Book Studies (New York: Church Pension Fund, 1970), 13. Holy Baptism: A Liturgical and Pastoral Commentary (New Jersey: Associated Parishes, 1987), 3. The Book of Common Prayer, 1979, 308. William Sydnor, The Prayer Book Through the Ages (Harrisburg, PA: Morehouse Publishing, 1997), 120. Louis Weil, A Theology of Worship, vol. 12, The New Church’s Teaching Series (Lanham, MD: Cowley Publications Book, 2002), 12. Farwell, Baptism, Eucharist, and the Hospitality of Jesus, 228. The Book of Common Prayer, 1979, 855. Farwell, Baptism, Eucharist, and the Hospitality of Jesus, 225. The Book of Common Prayer, 1979, 860. Syndor, The Prayer Book Through the Ages, 120. Farwell, Baptism, Eucharist, and the Hospitality of Jesus, 236. Richard Fabian, “The Scandalous Table,” in Water, Bread and Wine: Should We Offer Communion to People before They Are Baptized? (Leeds, MA: LeaderResources, LLC, 2012), 27. The Book of Common Prayer, 1979, 362. James Farwell, “Baptism, Eucharist, and the Hospitality of Jesus: On the Practice of “Open Communion”” Anglican Theological Review 86, no. 2 (2004): 221-222, accessed October 15, 2015, http://www.anglicantheologicalreview.org/static/pdf/articles/86.2_farwell.pdf. Thomas B. Falls, Writings of Saint Justin Martyr, The Fathers of The Church (New York: Christian Heritage, 1948), 105. Augustine, Sermons (230-272B) on the Liturgical Seasons, trans. Edmund Hill, ed. John E. Rotelle, vol. III/7, The Works of Saint Augustine: A Translation for the 21st Century (New Rochelle, NY: New City Press, 1993), 300-301. The Book of Occasional Services, 2003: Conforming to General Convention 2003 (New York: Church Publishing, 2004), 114. Augustine. Sermons (230-272B) on the Liturgical Seasons. Translated by Edmund Hill. Edited by John E. Rotelle. Vol. III/7. The Works of Saint Augustine: A Translation for the 21st Century. New Rochelle, NY: New City Press, 1993. The Book of Common Prayer and Administration of the Sacraments and Other Rites and Ceremonies of the Church According to the Use of The Episcopal Church. New York: Oxford University Press, 1979. The Book of Occasional Services, 2003: Conforming to General Convention 2003. New York: Church Publishing, 2004. Fabian, Richard. “The Scandalous Table.” In Water, Bread and Wine: Should We Offer Communion to People before They Are Baptized?, 27-38. Leeds, MA: LeaderResources, LLC, 2012. Falls, Thomas B. Writings of Saint Justin Martyr. The Fathers of The Church. New York: Christian Heritage, 1948. Farwell, James. “Baptism, Eucharist, and the Hospitality of Jesus: On the Practice of “Open Communion”” Anglican Theological Review 86, no. 2 (2004): 215-38. Accessed October 15, 2015. http://www.anglicantheologicalreview.org/static/pdf/articles/86.2_farwell.pdf. Farwell, James W. This Is the Night: Suffering, Salvation, and The Liturgies of Holy Week. New York: T & T Clark, 2005. Holy Baptism: A Liturgical and Pastoral Commentary. New Jersey: Associated Parishes, 1987. Holy Baptism with the Laying-On-Of-Hands. Vol. 18. Prayer Book Studies. New York: Church Pension Fund, 1970. Schnitker, Thaddaeus A. The Church’s Worship: The 1979 American Book of Common Prayer in a Historical Perspective. Frankfurt Am Main: Peter Lang, 1989. Shepherd, Massey Hamilton, Jr. The Oxford American Prayer Book Commentary. New York: Oxford University Press, 1973. Sydnor, William. The Prayer Book Through the Ages. Harrisburg, PA: Morehouse Publishing, 1997. Sydnor, William. The REAL Prayer Book: 1549 to the Present. Wilton, CT: Morehouse-Barlow, 1978. Weil, Louis. A Theology of Worship. Vol. 12. The New Church’s Teaching Series. Lanham, MD: Cowley Publications Book, 2002.